So you’re nuts about beer and you want to take your passion to the next level, but you’re not sure where to begin? 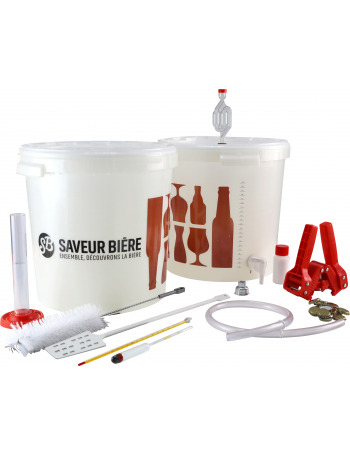 This comprehensive version of the Basic Brewing Kit is designed for amateurs who want to brew their own beer at home using Concentrate Beer Kits: a simple way to brew tasty beer. It’s a great, foolproof way to get started, and the addition of measuring equipment (test-tube, hydrometer, etc.) give you a much more hands-on brewing experience. To complete the set you just need a Concentrate Beer Kit (the ingredients) and empty bottles to keep your precious brew in once its ready. Choose from beer kits in a number of styles Brewferm, Muntons, Black Rock and Coopers. If you can’t decide on a kit (there’s a lot to choose from), why not try our quality Complete Advanced Brewing Kits for Blonde, Amber and Brown beers to help you make up your mind?